Since 2011, fibre broadband has been transforming the way that people work and play in Cornwall and the Isles of Scilly. At the same time, it has enabled businesses in the region to work much more effectively. By the end of this phase, over 132,000 km of optical fibre had been laid – enough to stretch around the globe three times! Over 700 new roadside cabinets had been installed to help support the new network. The project required 1.2 million hours of engineering work. This was all made possible by a massive £132 million investment: £53.5 million from the European Regional Development Fund and £78.5 million from BT. 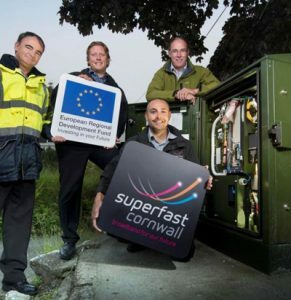 By 2015, Cornwall was recognised as having one of the best rural fibre broadband networks in the world and the Superfast Cornwall programme received six prestigious awards for its success. This phase of the programme also featured a significant amount of research into innovation through fibre broadband in Cornwall and the Isles of Scilly. This was led by ‘Superfast Cornwall Labs’, a collaborative project. Find out more. There was also a considerable amount of research and evaluation of the programme’s impact. Find out more.